Once again, big changes are happening for the Blues, good and disappointing. Steve Ott is extending his stay in the Midwest with a two-year extension contract, worth roughly $5.2 million. Despite Ott’s zero goals during the 29 games with the Blues thus far, Steve Ott has a lot to offer the Blues. His charismatic nature puts his fellow teammates at ease on and off the ice; further his gritty style of playing is one the Blues value and understand. Ott has a faceoff percentage just over fifty, and is a veteran of the game. He knows how to read plays and he’s hardly afraid of a scuffle on the ice. Ott will be a good third or fourth line man for the Blues. Despite this good news, and all the new additions to the team after the recent NHL Draft, a dark cloud looms over the St. Louis skies at the news of Vladimir Sobotka’s imminent departure. Word spread quickly about Sobotka’s decision to potentially join the KHL.. St. Louis’ GM Doug Armstrong remained hopeful these last three months, having been in good communication since the Russian Winter Olympics ended, about Sobotka staying with the Blues. The next few months passed in the same way, potential contracts being drawn up, numbers rolling and now…arbitration. 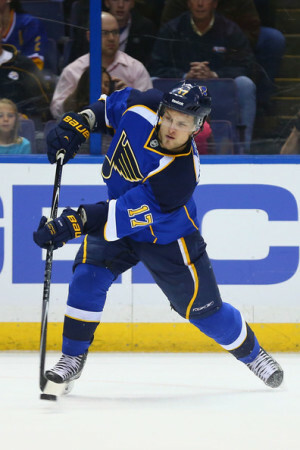 #17 Vladimir Sobotka is reportedly leaving the St. Louis Blues for a three-year contract in the KHL. The rumor mill suggests Sobotka will be getting a better deal by going to the KHL now, and returning to the NHL at a later date. The Blues were reportedly offering several deals, with the last settling around $3 Million for a two-year contract for the offensive player. Early on Wednesday Jul 10th, the Russian team, Avangard Omsk announced on their website the signing of restricted free agent, Vladamir Sobotka to a three-year contract. Sobotka had also decided to changing agents, leaving Stephen Bartlett for Petr Svoboda, a former NHL player turned agent, in the same month. The St. Louis Blues have taken to arbitration to settle the matter quickly, doing what is best for the club. The arbitration hearing will take place on July 21st. Armstrong is still unsure about whether or not Sobotka will show up.